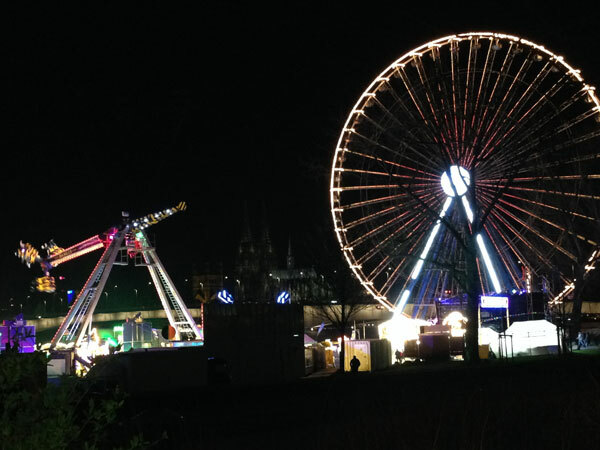 The great spring fair in Cologne is back in full swing! Until April 10, 2016, the children and of course the adults may enjoy on the Easter or spring fair. Just from 03/26/2016 until April 10, 2016 (ie exactly 16 days), you can have fun on the Rhine in Deutz again great. This year there are even some new rides and attractions: Daemonium, premieres Heroes and the après ski party! The classics like the Ferris wheel or the wild mouse are also back again! There is however a small square change these rides. For example, the wild mouse now placed toward Chocolate Museum and the Ferris wheel overlooking the cathedral. Here with us, you'll of course an actual photo of the fair at night! Since radiate the individual attractions with its many lamps and light fixtures to create a terrific atmosphere. Giant swing "The Real Nessy"
And the three new highlights we provide as follows: The "Daemonium" is the largest transportable haunted the world! Get some games scare really, so do not forget your stay in Cologne :) The "Apres Ski Party" is a running track, which, ultimately, calls your balance, responsiveness and your skill. Recently even the "Heroes". The fare for the "Daemonium" is 5 euros, also a trip on the "Flash", the price of the "Apres Ski Party" and the "Hereos" are respectively 3.50 euros. You might want as lovers (which may have stayed in our apartments!) Take a ride on the Ferris wheel? However, an unforgettable experience with the most beautiful panorama of Cologne already costs Proud 6 Euro! But no matter what you do there at the fair if you test all attractions, just a tasty Kölsch and a bratwurst eating or simply stroll through the fairground: The fun is guaranteed! We hope you enjoy it!